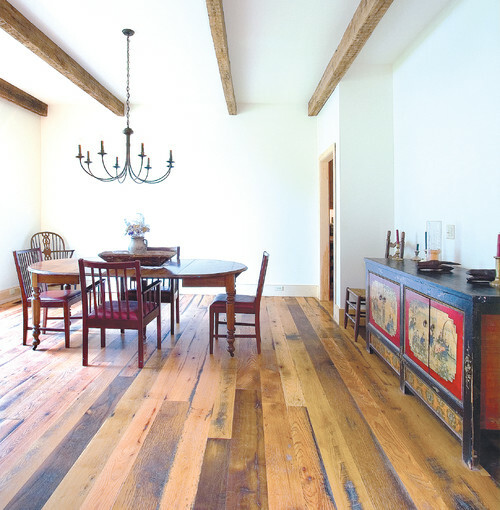 For centuries, wood has been by far the most popular material for floors in homes across America varying from the rough-hewn puncheons of pioneer days to the small carefully fitted strips in parquet flooring to long-lasting antique hardwood planks. 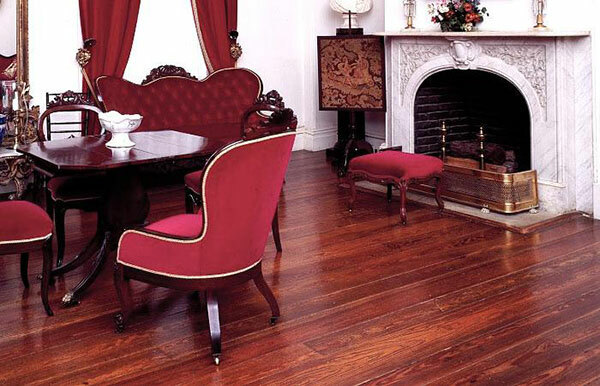 The choice of woods for flooring in Victorian houses, farmhouses, mansions and plantations depended upon the relative merits and costs of various woods and how they would be treated, whether merely planed smooth and left unfinished, or what kind of finish would be used. In general, the hardwoods made better floors than the softwoods. They wore more evenly, were less likely to sliver, took a more durable finish, and were more attractive in appearance. They were usually more expensive than softwoods, but this was somewhat offset by their good wearing qualities. 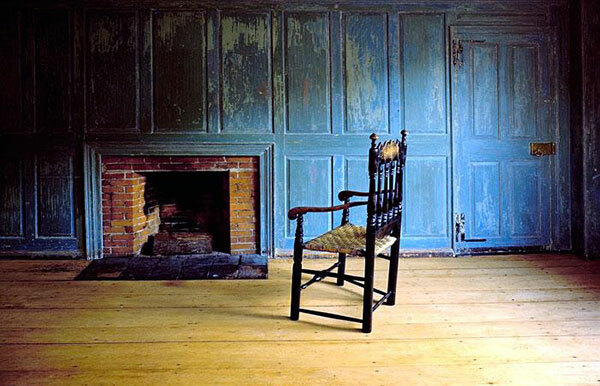 Of the antique hardwoods, oak and maple were the most used, and birch, beech, and others to a limited extent. The so-called softwoods included the various kinds of conifers. Of these, long-leaf pine and Douglas fir, or red spruce, as it was sometimes called, were perhaps the most durable for floors. Whatever kind of wood was chosen, certain general points were considered. The way in which flooring was sawed had much to do with the beauty of the grain and the durability of the surface. In general, quarter-sawed flooring was best. The boards were less likely to shrink and swell, the surface was more durable than in plain-sawed lumber, and in oak especially the grain was shown to the best advantage. All flooring would be properly dried so that it was not seriously affected by heat and moisture after it was laid. The thickness and the width of flooring varied: 7/8 inch thick by 2-1/4 inches wide was a good size to use. 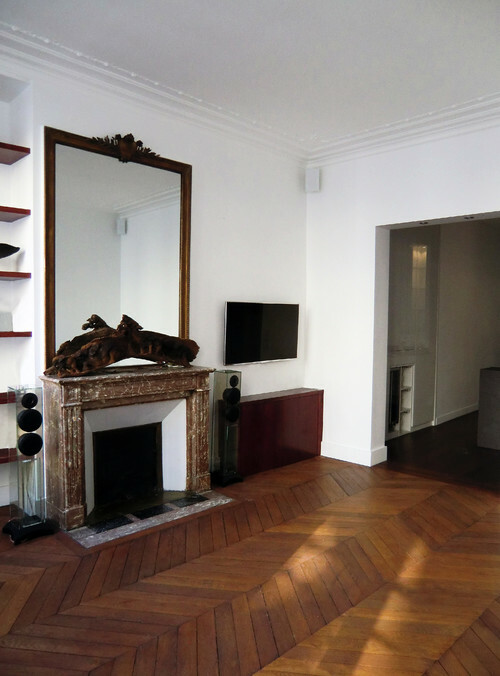 Both antique hardwood flooring and softwood floors were used either with or without finish and with or without covering. Hardwoods were usually finished and partly covered with rugs or left bare, and softwoods were generally used for floors that were to be covered entirely. Some of the more durable softwoods were successfully finished and used either with or without rugs. Wood floors were finished in a variety of ways, depending partly on the kind of wood and partly on individual preference. Wood finishers themselves often disagreed about the best method of treating floors, but all agreed that it was better to use the best materials. Many preferred, for hardwood floors particularly, to keep the natural color of the wood and at the same time give it a smooth durable finish that could be cleaned and renewed with the minimum of effort. Though darker colored floors generally gave the best effects, light colored floors had the advantage of showing dust and footprints less readily. Stain, filler, oil, paint, varnish, shellac, and wax, or a combination of two or more of these materials, were used. 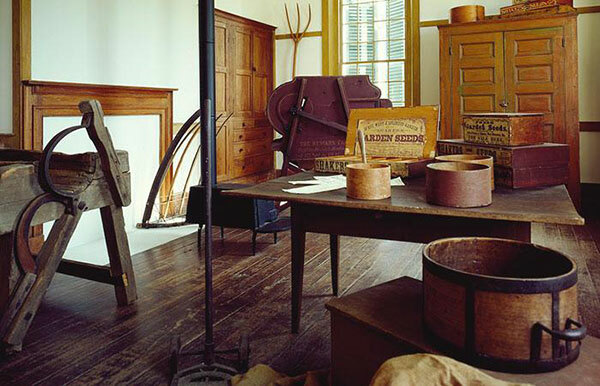 Oak and maple floors, for example, were often finished with a colorless filler, white shellac, and light-colored wax or pale varnish, a treatment that preserved the natural color of the wood with little change. A somewhat golden tone was obtained by using shellac or dark varnish. Before any finish was applied, the floor was made smooth by planing and sandpapering parallel with the grain of the wood, and then swept and dusted with a soft cloth. If the sandpaper was fastened on the bottom of a heavy block of wood to which a handle was attached, or better still, on the bottom of a weighted polishing brush, the work was easier. 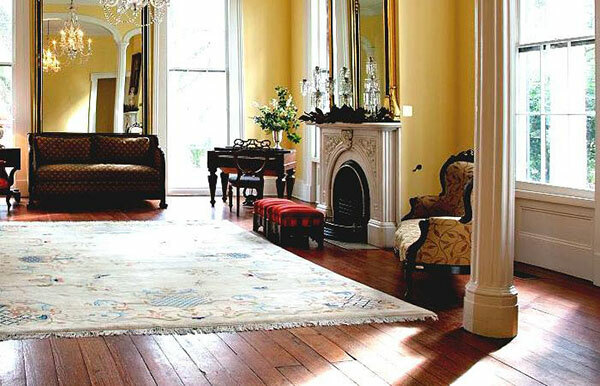 Stains were used on antique hardwood floors to bring out the grain of the wood, or to make them harmonize in color with other woodwork or with furnishings, or to give certain softwoods tones similar to hardwoods. Oil and water stains, so called because of the solvent used, were the common kinds. Oil stains were easy to apply evenly and did not raise the grain of the wood, but they did not penetrate very deeply and were likely to give a muddy effect. Water stains, on the other hand, soaked in readily, gave a clear color, and were cheaper than oil stains, but raised the grain of the wood so that sandpapering a second time was often necessary. 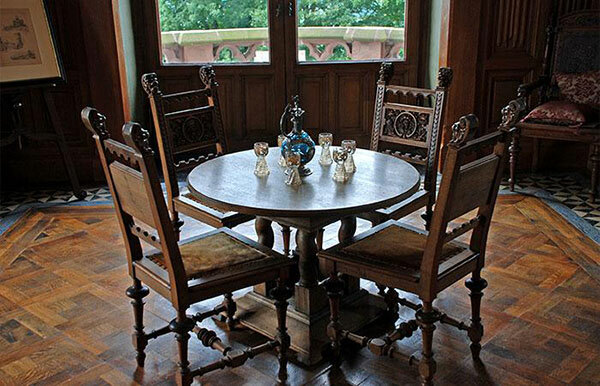 Water stains were used on either hardwoods or softwoods, but as a rule oil stains were not so successful on hardwoods. Before using, the stain was tested on an inconspicuous part of the floor or on a sample of the same kind of wood. If the color was too intense, the stain was diluted with the kind of solvent with which it was mixed or with other suitable liquid. For example, an oil stain was diluted with turpentine, and a water stain with water. 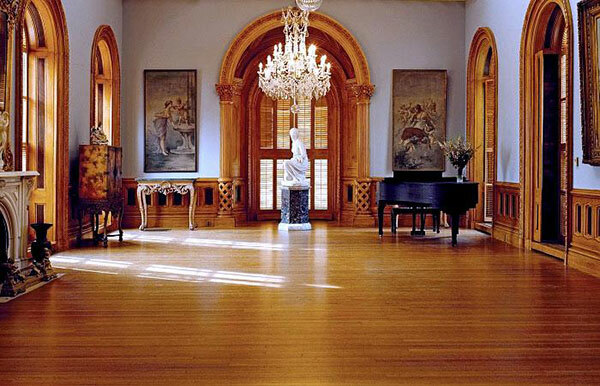 Varnish gave antique floors a hard, smooth, glossy finish, and was easy to apply and to clean. Under hard usage, however, it was likely to wear off, leaving patches of bare wood that remained unsightly even after re-varnishing. Successive coats tended to darken the floor. 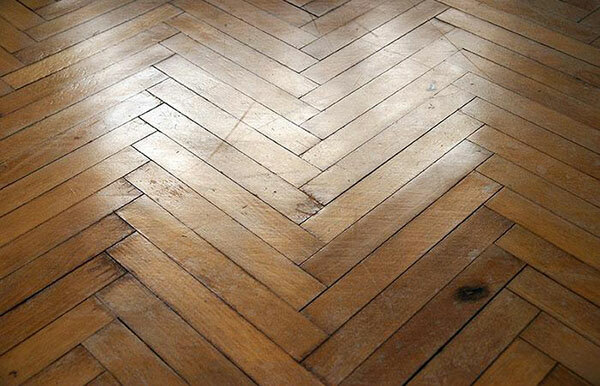 Varnish was a common finish for softwood floors, but wax was preferred by many for hardwood. 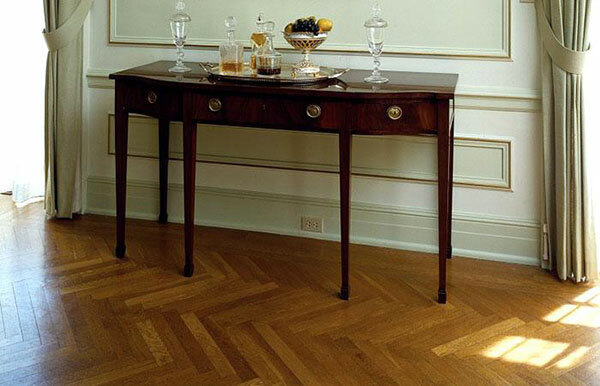 Waxing was considered by many the most attractive and practicable finish for antique hardwood flooring. It preserved the natural color of the wood, brought out the beauty of the grain, and was easily revived and renewed. 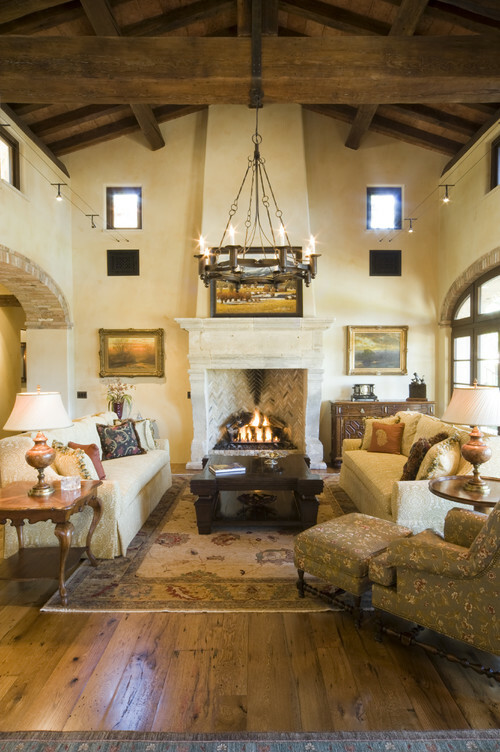 Given the proper care, waxed floors improved with age, even under hard usage. In some of the European palaces, for instance, floors that have been polished for centuries with nothing but wax were still bright and beautiful in color though worn thin by use. The chief objections to waxed floors were the amount of labor required to polish them and the fact that water turned the finish white. These water spots, however, were quickly removed by rubbing on a little wax with a woolen cloth or a weighted brush. Paint was very commonly used on softwood floors, but was not a very durable finish and worn places could not be satisfactorily patched. Painted floors were, however, easy to clean, for the paint formed a coat impervious to water and grease, and they could be made to match or harmonize with woodwork or furnishings. Paints, like varnishes, varied in durability according to the materials in them. 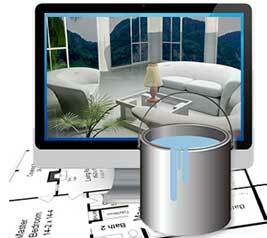 Special floor paints of good quality were on the market or could be custom mixed. If only one or two floors were to be painted, 1 gallon was generally enough for three coats on about 200 to 300 square feet of floor. A kitchen floor would have three coats of paint, and the wood would be clean, dry, and free from dust before the paint was applied. Each coat of paint was thoroughly brushed into the wood, lengthwise of the grain, and allowed ample time to dry. Good tools were essential for finishing antique hardwood flooring. Brushes for applying stain, varnish, paint, and oil were manufactured in various sizes and qualities. In general, a wide brush of good quality was found more convenient and economical, and when properly cared for could be used over and over again. A varnish brush was kept in the varnish in which it was used or in case of shellac varnish in alcohol; but brushes used in oil paint and oil stain, unless they were to be used again within a few days, were thoroughly washed in turpentine and washed again in warm soapsuds, thoroughly shaken, and hung up to dry with the bristles down. Paintbrushes that were to be used again the next day were simply wrapped in several thicknesses of paper, or kept for several days with the bristles submerged in turpentine. Brushes used in water stain were washed and rinsed in clear water. For polishing a waxed floor, a long-handled weighted brush was the most convenient tool. For best results it was clean, and under no circumstances was it allowed to come in contact with oil. A slip-on cloth cover was found convenient to protect it when not in use. Occasionally the brush was soaked and washed thoroughly in lukewarm water to which a little household ammonia was added (about 3 teaspoons to a quart of water), rinsed in clear water, turned on its side, and dried in a current of air, but not near a hot stove or radiator. Clean cotton and woolen cloths or pieces of woolen carpet were also needed in finishing and polishing floors.